India is a rich cultural land. Indian wedding ceremony and the festivals which are celebrated here with great happiness and devotion and represent the rich cultural heritage, the traditions, the rituals and the customs of the specific state and religion. Religious weddings portray the historical significance of a ritual. Like other state weddings, Bengali weddings are known for its distinguishes traditional rituals which showcase its state and regional rich culture. If you have witnessed traditional Bengali wedding ceremonies, you might have seen the groom and the bride adorning magnificent headgear on their head. i.e., the Topor and the Mukut. The Topor and the Mukut are the customary and intrinsic part of the Bengali weddings. The handsome groom wears the headgear which is known as Topor and the Bengali bride adorns the headwear called as Mukut. These head accessories are made up of Sholapith (a milky white spongy plant which is used in making crafts ) and are white in color. These are very fragile and soft. The Topor is a conical shaped crown with two pompom hangings near the ears. The Topor is worn by the groom before the commencement of the wedding ceremony and enhances the overall look of the groom and goes perfectly well with his outfit. Traditionally, It is gifted to the handsome groom by the bride’s parent that is believed to bring good luck in their lives. Similarly, the magnificent Mukut gives the bride a queen look elevating the elegance and beauty of her. Conventionally, if a Topor breaks down, it is considered inauspicious and is flowed down in water. It is also said if the Topor catches fire due to any reason, it brings bad luck for the wedded couple. The base of the Topor is customized in accordance with the groom’s head whereas measurement is not that important for the bride’s headpiece as it is tied around her head through the veil or ribbon.The design of the Topor and the Mukut is similar to each other. Though the shape differs and is crafted by the Malakars who are specialized in making the stunning headwear adornments. You can see different intricate Topor and Mukut designs in the Bengali market and white is the significant color over an ancient period. Now, some artificially made headgear is also available in markets. 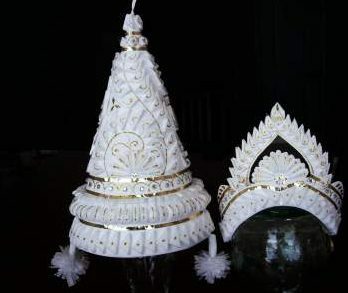 According to a legend associated with it, it is evident that the Topor was crafted because Lord Shiva wanted to wear a special headwear for the wedding ceremony and he gave this task to Vishvakarma but he failed to design a beautiful and eye-catching headgear as he was only specialized in handling hard materials. Later, the Lord Shiva assigned a Malakar to make a headgear using Sholapith. From then, the Topor became a significant part of traditional Bengali Hindu weddings.